Our super star Hula Hooper of the day is Joshua!! Our Star Writer of the week!! What fantastic writing on Spring using describing words! Well done. Spring Poem for National Poetry Day. Raffle tickets for sale, for a chance to win a Easter Hamper!! 25p each for a full strip for £1! This week in phonics we are learning new sounds. Group 1 have moved onto phase 4 final blends- these are fl,lf,lk and lp. We now have a Group 2 in phonics. These children have now moved onto reading cvcc/ccvc words such as frog, pram, drill, ping. The focus is for the children to be confident in reading longer words without saying each sound out loud and becoming more confident in reading the word. Group 3 are focusing on segmenting and blending confidently with the sounds already taught. This is a crucial stage of reading to secure before we move onto learning any new sounds. This stage of reading may last for a few weeks however is crucial to secure their reading skills. We try to make our phonics sessions fun so on YouTube we watch Geraldine the giraffe. She helps the children to learn new sounds. We also use the website phonics play which is fantastic for fun interactive games. The children could play these games independently. This week in Literacy this week our topic is growing and planting. The children will be going on a spring walk around the school looking at the plants, tress and ground to observe change in our environment. From this we will then be using describing words in our writing to enhance and develop our writing. Activity 1 will be labelling pictures using adjectives such as long grass or yellow chick. Activity 2 will be the children writing independent sentences on spring explaining how our plants change using adjectives. Such as – Green leaves start to grow on the tall trees. This week in Maths we are learning subtraction within 20. We are using the counters and cubes resources to support the children when subtracting. The beginning of the week is focusing on the children understanding what subtraction is and how we subtract the small number from the large number to find the remaining number. We are introducing the symbols - and =. We will be encouraging children to independently complete subtraction sentences in the classroom. Watch out for the pictures! This week the children have been using cubes to help them with understanding the concept of subtraction. This week in Literacy this week our topic is growing and planting. The children will be learning the life cycle of a sunflower. Activity 1 will be sequencing pictures in the correct order of the life cycle. Activity 2 will be to label different parts of the sunflower. The children will be planting their own sunflower and we hope to observe and learn how the flower grows from a seed to a flower. Group 1 have moved onto phase 4 blends- these are st,str,thr,tr and tw. Group 2 have just completed phase 3 sounds. We are now focusing on segmenting and blending confidently with the sounds already taught. This is a crucial stage of reading to secure before we move onto learning any new sounds. This stage of reading may last for a few weeks however is crucial to secure their reading skills. This week in Maths we are learning addition within 20. We are using the Numicon resources to add together to find the total amount. The beginning of the week is focusing on the children understanding that they are adding two groups of objects together to find a total number. We are introducing the symbols + and =. We will be encouraging children to independently complete addition sentences in the classroom. Group 1 have moved onto phase 4 blends- these are scr, shr, sp and sl. This week in Maths we are learning all about weight using balancing scales. We are using real life everyday objects in the classroom to balance in the scales. The children will focus on the language heavier and lighter. When using the scales we will explain the importance of the object that is down is the heavier object and the object that is up on the scale is the lighter object. The children will be set challenges to independently use the scales and identify the heavier/lighter object. This week in Literacy our story is The Enormous Watermelon. Our focus will be the children understanding story structure e.g. what happens at the beginning, middle and end of the story. Who are the main characters in the story and the children can name the story setting and describe the setting. We will have two writing challenges this week; one challenge is to label different parts of the story. The final writing activity will be to write speech bubbles of what they think each character is saying. The Enormous Watermelon is a fun story for young learners about Old Mother Hubbard and her friends, Humpty Dumpty, Jack and Jill and many others.. Based on the classic story, the Enormous Turnip, this adaptation is ideal for kids who enjoying watching and reading with YouTube. This week in Literacy our story is Oliver’s Vegetables. Our focus will be the children understanding story structure e.g. what happens at the beginning, middle and end of the story. Who are the main characters in the story and naming the vegetables eaten by Oliver in the correct order. We will have two writing challenges this week, one challenge is to name and describe a vegetable from the story such as- A green cabbage. The final writing activity will be to write a letter to Oliver focusing on capital letters, fingers spaces and a full stop. This week in Maths we are learning addition within 20. We are using real life objects such as fruit and vegetables to add together to find the total amount. The beginning of the week is focusing on the children understanding that they are adding two groups of objects together to find a total number. We are introducing the symbols + and =. We will be encouraging children to independently complete addition sentences in the classroom. Group 1 have moved onto phase 4 blends- these are sn, pl, pr and sc. Group 2 are learning the sounds- ear, air, ure and er. Thank you our wonderful police officers who came into school with their police car to talk to all of our children in Early Years. The children loved listening to the talk, having a turn in the car and watching and listening to the sirens. Thank you to Oscar's dad for coming into to school to explain about his important job as a journalist. Thank you to Jack's mum for coming into school talking to the children about her important job as a Physiotherapist. Thank you to Parker's dad for coming into school and talking to the children about his important job as a Fire Fighter. Our focus this week continues with the theme People Who Help Us. This week we are looking closely at the role of a doctors and nursers. The children will be learning the qualities needed to be a doctor or nurse. We will be focusing our writing to explain the important job they do. This week in Maths we are learning 3D Shapes. We are learning that these shapes are special because they are solid shapes. We are learning the names such as sphere, cylinder,cube, cuboid, pyramid and triangular prism. Later in the week the children will be matching 3D shapes to everyday objects around school and hope. We will be encouraging the children to explore the school environment indoors and outdoors to search for 3D Shapes. The Singing Walrus presents "3D Shapes Song" - an upbeat, funky music video that shows various three dimensional shapes. Join our characters as they learn 4 different 3D shapes - cube, cone, sphere, and cylinder. During each verse, a 3D object (dice, party hat, ball, soda can) is shown next to the 3D shape so that kids can see examples in everyday life. Group 1 have moved onto phase 4 blends- these are bl, br, cl and cr. Group 2 are learning the sounds- ur, ow, oi and ear. Well done Parker for receiving the special trophy from football club, for being man of the match for two matches. Also showing fantastic leadership skills supporting and helping other children during training. This week in maths we are re-visiting our 2D shapes at the beginning of each maths session. We will naming each of the shapes and discussing the properties,such as how many sides and corners each shape has. Our main focus this week is length. We will be exploring length in height and measuring objects using cubes. We will have 'wow' words displayed in the room such as big, small, biggest, smallest, tall, taller, short and shorter. To help at home you could measure objects in the home environment and discuss the height of family members. We also have a fun interactive game the children could play on a tablet or phone. Please see the following link. This week in Literacy our topic is "People Who Help Us". Our focus is the Police this week. The children will be learning all about the very important job the Police do, how they help us and what it takes to be a police man or woman. We have lots of fun and exciting activities to complete in class, police books to read and lots of fantastic dressing up clothes to develop our imaginative play. We have just finished the phonics assessments for all the children. We are so happy with the progress the children are making with their phonic sounds, segmenting and blending. In the homework packs on Friday we will be sending home a copy of your child's phonic assessments. This will show you what sounds your child knows and we would appreciate it if you could help to practise the sounds at home. 1 and 1 is 2,2,2. 2 and 2 is 4,4,4. 3 and 3 is 6,6,6. 4 and 4 is 8,8,8. 5 and 5 is 10,10,10. Repeat song..... Once repeated i ask the children to answer double 4 is.... double 1 is..... and I ask the questions in random order. Our focus in Maths is comparing objects and groups of objects focusing on the language- less, more and the same. Please see the attached link to play the game at home. Phonics- This week is phonics assessment week for all the children in reception. We will be assessing what sounds the children know and identify any missing gaps. This helps us to plan accurately for your child's progression in phonics. Phonics play is a free website for you and your child to access. It has lots of fun games to help your child to develop their reading skills at home. Please see the attached link to access the website. Literacy- Our theme this week is pets and animals. Our story focus is called The Great Pet Sale. The week the children will be writing the names for the animals. Then our focused writing will be for the children to write words or sentences to describe the animals. Uploaded by Neil Ford on 2017-11-04. Fantastic independent writing this morning!! The children have had lots of fun dressing up in our new clothes!! We have been princesses, superheroes, doctors and vets. The children had lots of fun pretending to be their characters. Our focus for Maths this week is capacity. The children will be focusing on the key language- empty, nearly empty, half full, half empty, nearly full and full. To help understand and explore capacity the children will experiment with different material, such as filling different size containers with water, sand, rice and lentils. This week in Literacy our story focus is Mog and the Vet. We are focusing on Mog the cat and using adjectives to describe what Mog looks like. We have used images of Mog to help the children to use language using, size, colour, and features. The next step is then for the children to produce writing that includes the adjectives such as- Mog has black fur. Uploaded by Bluebird bedtime Stories on 2018-06-13. Fun with musical instruments. The children have been encouraged to make their own rhythm and beats using instruments. This week in phonics group A will be re-visiting the phonic sounds- ear, air, ure and er. Group B will be re- visiting sounds- sh, th, ng and ai. Please take a look at the website top marks. It's a fun, interactive website to help your child to play fun games and learn at the same time. Please see attached link. Our focus for maths this week is learning the days of the week. We are teaching the children to order the days of the week in the correct order starting with Monday as the first day of the week. This helps the children to understand they come to school for 5 days and have 2 days at the weekend at home with their family. We are asking key questions such as- "Today is Wednesday, what day is tomorrow?". The Wodonga Library is making Story Time with Mrs Mac available online. A new title will be uploaded each fortnight, with Mrs Mac reading wonderful children's books and singing songs and rhymes with the help of her new assistant Bluey, who is now a regular feature at Story Time. Happy New Year and welcome back to school. This week is a busy week as we are straight back into our learning and routine. This week our story is called the Tiger who came to tea. The focus for learning is sequencing and ordering the pictures of the story in the correct order. We will be looking at key events in the story and writing words and sentences from the picture. Please watch the story link attached from you tube. The children getting creative making space planet pictures using sponges and glitter. Exploring the coloured ice stars and planets. Our Maths challenge this week is to find the number cards and match them to the correct double!! all the way to ten. Our story this week is called "Whatever Next". This links with our theme of Space. This week we are focusing on sequencing,understanding book order and talking through blank level questions so the children have a good understanding of the story. In class we have changed our home corner into a deconstructed role-play with cardboard boxes, sheets or materials and props. This enables children to use their own imagination and create and share their own experiences. Sophie Thompson narrates Jill Murphy's all time classic, Whatever Next. In Maths this week are emphasising to importance of counting forwards and backwards to twenty. We call this active counting so we use movements such as clapping, stamping and stretches to help us when counting. Linking in with our topic this with with Space we are counting down everyday from 20 to 0 pretending we then blast off in space. Our main learning focus this week is one more and one less than any number within 20. We are using lots of practical resources such as number lines, counters, cards and number shapes to support their understanding of one more and one less. Please see the link below from youtube which we have used to support some of our Maths sessions. WWW.HARRYKINDERGARTENMUSIC.COM ...or find me on Teachers Pay Teachers! www.teacherspayteachers.com/Store/Harry-­­Kindergarten-Music HARRY KINDERGARTEN MUSIC, LLC Hip educational songs & videos for the K-2 Classroom! Song: ONE MORE! Educational Content: This song emphasizes that when you go to the right (on a number line, number train, etc.) you always get MORE. In Literacy this week we are learning all about Space. We are focusing on the moon, star, sun and planets. We have lots of fun writing activities to complete to name the objects in space and describe them. In class we have lots of creative activities such as planets paintings, rocket modellings, ice stars and planets. Please see the attached PowerPoint all about Space. Remembrance Day Celebrations. This week the children have been learning all about Remembrance Day and why we celebrate and remember this special day. All the children in nursery and reception have worked very hard to make their own poppy and we have used red hand prints to make wreaths.All the children took park in a special silence. Making Remembrance Day Poppies for the class display. Well done Eli!! For achieving footballer of the week with his new team!! This week in Maths we are focusing on teen numbers. We are learning to recognise and say our teen numbers. Put them in the correct order from 10-20 and understand the value of the 1 in a teen number is 10. We will use different maths resources to help the children understand the value such as Numicom, deens and counters. The website topmarks is a fun way to help your child become more engaged with their learning. On this website there are lots of fun maths activities for your child to complete. In Literacy this week we are learning the story sparks in the sky, the story is closely linked to Bonfire Night. In Literacy session we are focusing on descriptive language to describe the sound of fireworks such as bang, pop, whizz and zoom. The children will also be sequencing the story using pictures and putting them in order from beginning to end. In Literacy this week we will be doing lots of learning based on the story 'The Little Red Hen'. We are going to write all about the characters and use adjectives to describe their personalities. We will be using words like 'happy, friendly, noisy'. You can practise using adjectives at home by describing the things around you e.g. that is a tall tree, or mummy is happy. In Maths this week we will be learning about sequencing. We will focus on our daily routine, months of the year and simple tasks like using a pen to write our name. We have many different routines during the day, and we all do things a slightly different way. Do you wake up in the morning and have your breakfast straight away? or do you brush your teeth first? ask your children about their daily routines in school. This week we are going to be doing lots of finger painting, we will be making autumn trees and our very own Little Red Hens. Today we have a fun learning session from Salford Royal Hospital. The school nursing team came into school to teach all the children in reception how to wash their hands properly. We had lots of fun games, videos to watch and hand washing to do! Celebrating World Mental Health Day by coming into school dressed in yellow! In literacy this week our theme will be Autumn and we will be looking at the special things which happen at this time of year and focusing specifically on all the things to do with harvest. We are going to look at recipes for pumpkin soup and by the end of the week, we will have written our own, made our own delicious pumpkin soup and eaten our tasty soup! Don’t forget, P.E. is on Friday- Please bring PE kits into school. This week our focus book is the funny bones. We are focusing on identify and naming different parts of the body. We have lots of exciting activities planned such as body yoga, skeleton labelling and simon says. The children have been practising our poem "I'm glad I'm me". We will preforming the poem in front of the whole school on Thursday. Stay tuned as the video will be uploaded on our class page and our Twitter page. Phonics Play This website is really useful for parents and carers wanting more information on phonics. It provides useful videos to watch and lots of handy tips to help your child at home with reading. 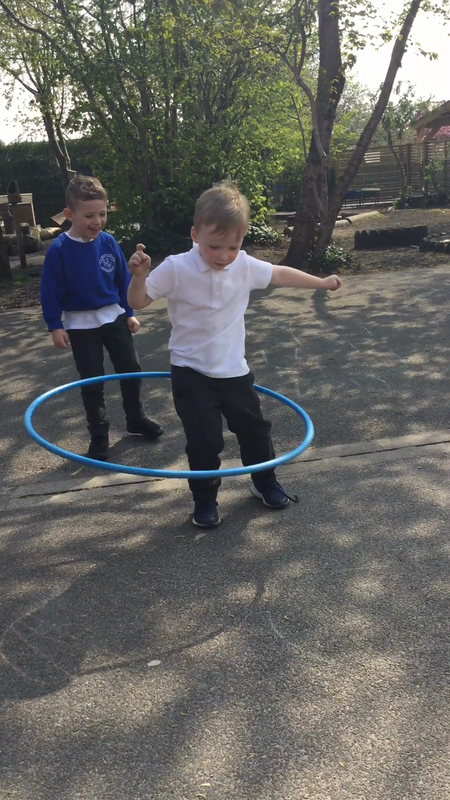 Week ending 28.9.18- This week we have been working really hard to develop our gross motor skills. This activities help to strengthen our muscles to get ready for writing. The children had lots of fun roller painting outside in the sunshine. Week ending- 28.09.18 This week in maths the children have been active counting to 20. 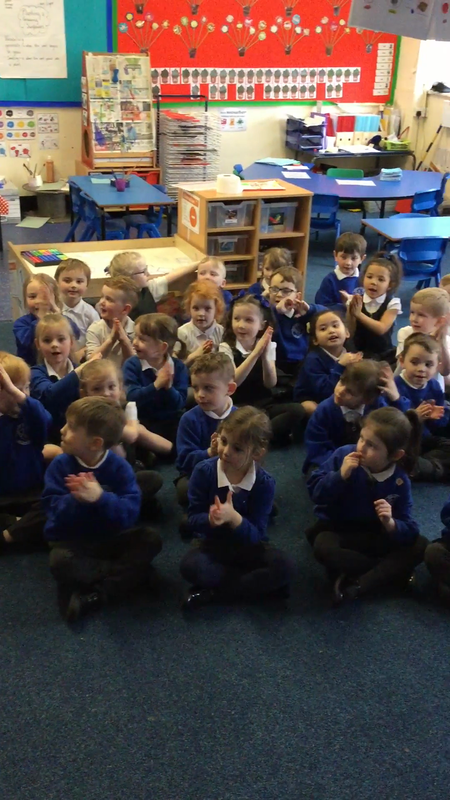 During our active counting we have been clapping hands, jumping, hopping and reaching for the stars. This week our focus for learning in maths has been understanding number and the quantity of each number. The children have been building cube towers to match a number and comparing sizes of each tower, focusing on the language greater and less. We have been busy learning our sounds and writing our letters. "I am star writer of the week". Join Jaime for a classic Cosmic Kids yoga adventure. We go on an adventure in yoga poses to the beach even into the ocean. We meet Squish and he helps us discover that it's fun to go on adventures ourselves and we just sometimes need to *decide* to be brave to have fun. We have had a busy week in reception developing our gross motor skills. The children have had lots of fun with cosmic yoga workouts on youtube. Follow the link below to complete a workout at home. During the first few weeks of this term we will be welcoming our new Reception class children into our school. We will be spending lots of time building friendships, learning school routines and rules. for you to play with your child at home. In writing this week we have been focusing on pencil control and movement. We have been encouraging our children to write the letters in their name. Any activities at home such as writing, colouring and painting really help your child to develop their fine motor skills. Miss Patel, Mrs Jones & Miss Overton.